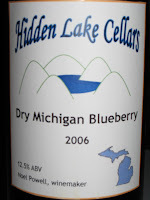 A couple of nights ago, I decided to crack open a bottle of my 2006 Michigan Blueberry wine to taste it for the first time after bottling. This wine is rather dear to my heart because it was the last wine I made in Michigan, plus it has a rather fascinating story. The blueberries were grown in northern Michigan and purchased from Kroger Supermarket in Ann Arbor in July 2006. They had a sale on 5 lb boxes of blueberries--the cashier's eyes got rather big when I showed up with 8 boxes! I will stress that I bought some for my wife's use in the kitchen, not just my winemaking! My aim for this wine was to try to reproduce the dry, full-bodied blueberry wine style that I had tasted from Bartlett's Winery in Maine (see my review here). The blueberries were frozen until January 2007. After preparing the very thick must, the total acid = 0.65% and pH = 2.88, so no additional tartaric acid was added. Fermentation commenced quickly within 24 hr of adding the starter, but proceeded at a rather slow pace. The very thick cap was punched down twice a day, and 4 g of Fermaid-K was adding prior to yeast addition, after 4 days at SG = 1.050, and after 11 days at SG = 1.046. The wine was pressed off the fruit skins on day 13 at SG = 1.038 and moved to a glass carboy to complete fermentation. However, after another 2 days, I detected very little active fermentation (even after heating to must to ~70 °F). I was a little concerned that the low pH was causing the yeast to go dormant, so I diluted the wine with 2 L of Brix = 25 water with TA = 0.65 %) and added lysozyme to prevent any possible MLF (blueberries contain citric acid which ML bacteria convert to acetic acid). Fermentation recommenced (SG = 1.039). This is where the fun began! The day after moving into a carboy, a massive ice storm swept through Michigan and knocked out our power for 4 days. Needless to say, it got rather cold in the house. In fact, I moved the wine to the basement just to keep the temperature above freezing. My wife, our guinea pigs, and I lasted 1 night and day in the house. The first night was spent huddled in front of the fireplace, while I threw a log on the fire every 45 minutes. I took the pigs to work with me the next day (rather amusing considering I worked at a pharmaceutical research facility--thank goodness for back doors and cardboard boxes). We ended up fleeing to a friend's house who had power so that the pigs would stay warm. Once the power was restored and the house reheated, I brought the wine back up stairs and heated back up to ~70 °F with an electric heat pad. Fortunately, fermentation recommenced, but still proceeded very slowly. After two months, the SG = 1.006 with 1.5 g/L residual sugar. Having been informed at the end of January that research site where I worked was being shut down, and a out-of-state move was highly probable, I really did not have the luxury to let the fermentation abide by its own terms. The taste at this point was pretty good--medium body, good fruit burst, and nicely balanced. I decided to halt the fermentation by chilling the wine in the garage (it was a cold spring in Michigan). After 24 hrs at 42 °F, the wine was racked off the lees and treated with 100 ppm SO2. Appearance: Medium garnet color. Tannin granules in bottom of glass. Nose: Fruity and citrus. Hints of cherries, strawberries and vanilla. Taste: Delightfully fruity palatte, medium bodied, with a good lingering finish. Slight sweet taste, but nicely balanced. "This is good stuff!" Admittedly, with a little residual sugar I probably shouldn't have labelled it as "Dry". However, 1.5 g/L falls in the dry to off-dry range, so I think I'm safe. To all those that managed to secure a bottle before I moved, it is very enjoyable and drinkable now. You might consider cellaring for anther 3-4 months, but that's your call!